In my first blog, I provided a brief introduction of myself to the Academic Practice group in regards to my research and professional background and outlined a self-assessment in regards to the skills and experience that I bring as well as areas that I feel need to be further developed. I also provided a brief outline of my research agenda within the broader context of Technology Education (aka Manual Arts / Design and Technologies) in Queensland secondary schools. Here, I intend to focus my thoughts loosely around the theme of “connectedness” within the broader notion of academic practice to demonstrate evidence of my learning and development throughout the unit thus far. Studying part time in the early stages of EdD coursework, I have quickly recognised many challenges that not only the course itself presents, but also issues around juggling conflicting demands of work, study and life in general. As an external, part-time student living a reasonable distance away from the closest campus, I don’t often have the opportunity to physically get to the uni to use the available facilities, network with other post grad students and immerse myself daily in the HDR culture that exists across the academy. Research has shown that part time HDR students have the most difficulty in accessing peer and academic cultures (Deem & Brehony, 2000), however, I recognise that significant developments in terms of the use of social media platforms have occurred since this publication and if the research was replicated now, findings would likely to be quite different. This unit has certainly enabled me to become better connected in many ways, particularly in the use of various social media platforms and networking. The following will highlight this theme throughout. At first glance, academia and social media might not appear to have an obvious connection. Social media use tends to be viewed as frivolous or as an activity undertaken for purely personal reasons, such as keeping in touch with friends or family. These views are often expressed in academic circles (Lupton, 2014b). Prior to my engagement in this unit, this would likely have been my response if posed a question regarding any relationship between social media and academia. It’s not something that I had ever really considered, been exposed to or challenged with. With no previous history in the use of common social media applications such as Facebook, Twitter, Instagram etc, I had limited exposure to the various platforms except to know of their existence and how frequently used they are by individuals as well as various organisations (e.g businesses, charities, clubs etc). However, as emphasised by Ito… “In the old days, being relevant was writing academic papers. Today, if people can't find you on the internet, if they're not talking about you in Rwanda, you're irrelevant” (Rowan, 2015). Was I disconnected perhaps? I didn’t feel this way (I’m on LinkedIn after all! ), but I have never really needed to explore this space that I’m playing in … until now. Maybe it wasn’t the case that I was ‘fully disconnected’, but more a case of ‘not yet connected well enough’! Whatever the case, my willingness to explore and learn more about the ‘how to stuff’ as well as the numerous benefits of playing in this space all has been beneficial in many ways (further explained later in this post). 1. What online tools can I use that will assist me with my research and academic development at this point and into the future? 2. How can I further engage with the many and varied available tools to locate academics, HDR students and others with similar interests across the world and share and promote my research? Although there is a definite relationship between both of these questions, the reality for me right now is that Q1 is more critical than Q2 as the majority of the preliminary work I am doing is around the review of the available literature within my research area and developing a deeper understanding of my proposed methodology. However, I also recognise that over the following two or three years, the questions above will likely not be in priority order, but more so running parallel with each other. I felt a real connection with the following quote from a blog that I recently read as it aligns nicely with my thinking and development to this point in the course: “Online platforms … can inform every step of the research process … enabling academics to become lifelong students” (Alampi, 2012). This, in my view, is a very powerful message, and one that found its way into my notebook. Numerous blogs as well as empirical research highlight the many and varied benefits for academics (including HDR candidates) to actively use social media platforms as a part of their work role and its growing importance within academia (e.g. Alampi, 2012; Dufty-Jones, 2015; Gruzd, Staves, & Wilk, 2012; Lupton, 2014a; Mewburn & Thomson, 2013; Pausé & Russell, 2016; Powell, Jacob, & Chapman, 2012; Willingham, 2016). Blogging (with proper references) as well as other media can position academic research on a global scale and provide rapid, reliable information in response to emerging issues (Powell, Jacob, & Chapman, 2012). 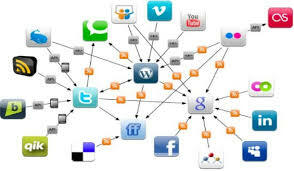 In addition, use of social media by academics allows for rapid sharing of research methods, results as well as conclusions in an open, transparent manner. Proponents of open, digital and social scholarship have argued that scholarly use of social media can “enhance the impact and reach of scholarship” as well as “foster the development of more equitable, effective, efficient, and transparent scholarly and educational processes (Veletsianos & Kimmons, 2012, p. 166). In order to provide a somewhat balanced approach to this issue, I recognise that there are some negative issues presented in the literature around academics’ use of social media platforms. Protection of privacy has been shown to be the major concern of scholars when using social media tools (Gruzd, Staves, & Wilk, 2012; Lupton, 2014a). There is also concern around the “blurring of boundaries between personal and professional use” (Lupton, 2014a), the risk of jeopardising careers through injudicious use of social media, the quality of content that is posted, time pressures, social media becoming an obligation for academics, excessive self-promotion by others, possible plagiarism of ideas, commercialisation of content and copyright issues and negative criticism from academics’ institutions (Kirkup, 2010; Lupton, 2014a). In terms of access, my experience this semester has been that some sites required for this unit have been restricted on the Education Queensland network. Whilst frustrating at times, the simple solution has been to access what I need at home through my own network. The Slack and Wiki sites used throughout this unit have been instrumental in creating a real collegial environment, enabling me to feel more connected to not only the work, but as important, the people involved in sharing the journey. This has been my first time engaging with Slack and to be perfectly honest, if I was given an option prior to the commencement of the course to use it or not, I would probably have stayed within my comfort zone and opted not to use it – even without the knowledge (and experience) of what the site enables users to do! Now, many weeks down the track, I feel truly grateful that I have been put in the position of whereby I have needed to use the sites as critical elements of engagement and learning within the unit. The functionality of both are fairly straight forward, and like most things – the more one uses it, the better one gets! As I’ve progressed through the first half of the semester, I’ve also been reflecting on ways to potentially incorporate similar techniques into my own teaching and learning processes at school beyond the (often clunky) LMSs available through the EQ network. Recognising the challenges that I’ve experienced accessing various sites at work, I’m now shifting my mindset from what is not possible, now to what is possible considering the departmental filtering and/ security framework. Certainly, there is the potential to use (accessible) social media platforms with my own students to drive curiosity in learning and engagement within the design and technology curriculum area as well as other areas across the school setting. In addition, I am exploring the potential to employ similar techniques to engage with other leaders and teachers in the design technology space across the state beyond simple email discussion lists. Whilst discussion lists are beneficial, use of similar platforms could be particularly useful for me in terms of assisting in locating suitable experts that I could approach to be involved in my study as part of the Delphi panel. At the very least, it could assist in developing a more collegial network of design and technology educators across the state and/or nationally and promote sharing of ideas, resources, research etc. I have explored a range of available online tools to assist me in locating the most recent available literature within my field of study as well as linking in with key academics with similar research interests. Following recent workshop discussions as well as dialogue between colleagues on the Slack site, I set up Google Scholar alerts using various key terms and phrases related to my area of study. While many of the alerts that have come through to my inbox have not been of particular interest, there has been one recently published paper (Avalla, 2016) that is particularly relevant to my proposed methodology and will be cited in my methodology chapter. Although I have already located many similar articles, many of these were published pre 2010 and simply, without the alert or future time-consuming additional data base searches, I may not have located it at all. Setting up the alert has already proved to be beneficial! Through further online reading within my area of interest, I stumbled across a blog (Anthony, 2012) comprising an interview with the influential futurist, Sohail Inayatulla. Already familiar with his work through reading a few of his papers, I was then able to dig a bit more deeply and subsequently follow him through various platforms including ResearchGate and Academia, providing me with easy access to a plethora of publications relevant to my work. Prior to my involvement in this unit, I would not have done this and as a result, I feel more “connected” to one of the world’s leading authorities on futures thinking and futures studies and am now easily able to stay up-to-date with current posts and publications. Interestingly, and somewhat disappointingly, there does not seem to be an active online presence of key researchers in the field of design and technology education, with the exception of those who specialise in the digital technology space (surprise surprise!). Whilst Technologies in the Australian Curriculum comprises of Design and Technologies as well as Digital Technologies, it is the curriculum area of Design Technologies (previously Manual / Industrial Arts) that I am focusing on. Key players in the Design and Technologies space tend to publish in journals, conference proceedings and books, but do not appear to be engaged with the various online tools frequently utilised by others. However, those who operate in the STEM / STEAM space tend to be very active users of social media for academic purposes and this is beneficial to my research to a degree. This unit has provided me a diverse range of opportunities to access and engage with social media in ways that I had never really previously considered in terms of how this can benefit my research, link with others internationally who have similar interests, and to promote the work that I am doing in the future. I genuinely see myself now more connected than I was at the beginning of the unit and I have developed a range of valuable academic skills and experience regarding the use of social media platforms for academic purposes throughout the first half of the semester. This unit has also prompted my thinking in regards to how I can use social media platforms to further benefit my academic journey moving forward as well as my day to day professional life in order to improve student engagement in learning and promote positive outcomes in design and technologies education. In addition, there is opportunities for me to use various platforms (including those existing and those that are yet to be developed) to promote increased connectedness across design and technologies educators locally, nationally and internationally. Gruzd, A., Staves, K., & Wilk, A. (2012). Connected scholars: Examining the role of social media in research practices. Computers in Human Behavior, 28, 2340-2350. Lupton, D. (2014a). Feeling better connected: Academics' use of social media. News & Media Research Centre, University of Canberra. Mewburn, I., & Thomson, P. (2013). Who do academics blog? An analysis of audiences, purposes and challenges. Studies in Higher Education, 38(8), 1105-1119. Veletsianos, G., & Kimmons, R. (2012). Assumptions and challenges of open scholarship. The International Review of Research in Open and Distance Learning, 13(4), 166-189.